This Fall for the Book, save the date for a presentation by S. Scott Graham. 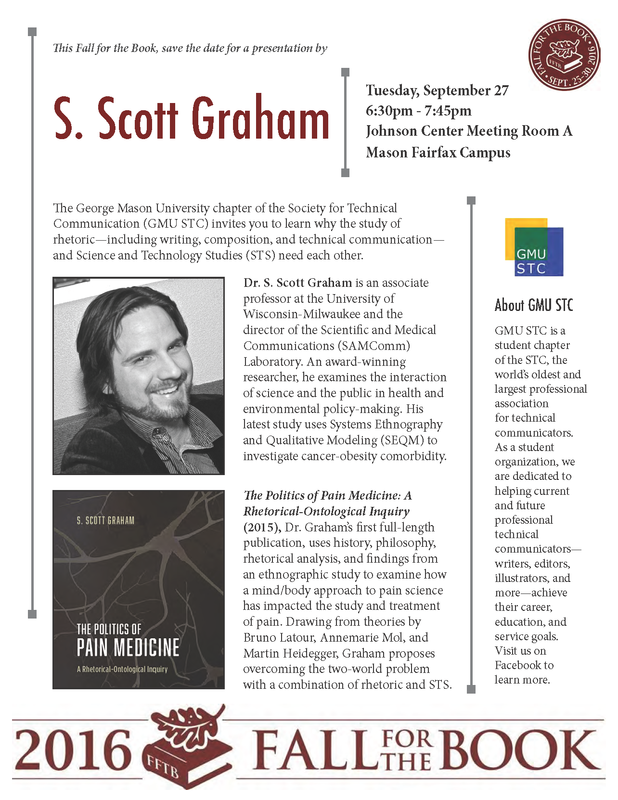 The George Mason University chapter of the Society for Technical Communication (GMU STC) invites you to learn why the study of rhetoric—including writing, composition, and technical communication—and Science and Technology Studies (STS) need each other. Dr. S. Scott Graham is an associate professor at the University of Wisconsin-Milwaukee and the director of the Scientific and Medical Communications (SAMComm) Laboratory. An award-winning researcher, he examines the interaction of science and the public in health and environmental policy-making. His latest study uses Systems Ethnography and Qualitative Modeling (SEQM) to investigate cancer-obesity comorbidity. The Politics of Pain Medicine: A Rhetorical-Ontological Inquiry (2015), Dr. Graham’s first full-length publication, uses history, philosophy, rhetorical analysis, and findings from an ethnographic study to examine how a mind/body approach to pain science has impacted the study and treatment of pain. Drawing from theories by Bruno Latour, Annemarie Mol, and Martin Heidegger, Graham proposes overcoming the two-world problem with a combination of rhetoric and STS. GMU STC is a student chapter of the STC, the world’s oldest and largest professional association for technical communicators. As a student organization, we are dedicated to helping current and future professional technical communicators—writers, editors, illustrators, and more—achieve their career, education, and service goals.